forms from the eligible candidates for filling up 46 vacancies through competitive examination. The above recruitment has published in employment news is on 21st November-2017. Candidates interested for these Stenographer, Assistant Grade III vacancies may visit the Korea dist court official website ecourts.gov.in/korea. Get the application form and notification from the same website. Last date to send application form is 15th December-2017 by 05.00 PM. Candidate should have upper age limit of 40 years and lower age limit of 18 years. Candidate should be graduation pass with 45 % marks are eligible for this Recruitment. District Court Korea will conduct written test/ Skill Test & Interview to select candidates for the Stenographer and Assistant Grade III recruitment vacancies. Full details of Available vacancies, Eligibility criteria, Application process, Age limits, Pay Scale details of District Court Korea Recruitment 46 Stenographer (Hindi/ English), Assistant Grade III jobs are given below. Last date for sending Application forms through post: 15-12-2017 by 5.00 PM. Total no of vacancies available in district Court Korea Recruitment are 46 posts. Total No of Posts: 46. 1. Stenographer (Hindi): 10 posts. 2. Stenographer (English): 02 posts. 3. Assistant Grade III: 34 posts. Candidate must have completed Graduation with 45% marks from recognized University. For detailed qualifications, please see the Korea Dist Court official notification. Age of the candidate should be minimum 18 years and maximum age limit is 40 years. Relaxations admissible as per rules. Pay Scale for the above vacancies is Rs. 5200/- to Rs. 20,200/- plus Grade Pay of Rs. 2800/ 1900/- plus allowances. Candidates will be selected for this Korea District Court Stenographer, Assistant Grade III recruitment vacancies is based on written examination, Skill Test/ Interview. Test details, syllabus & Exam pattern are mentioned in the notification. 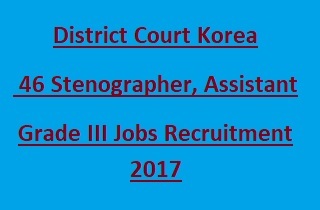 Korea District Court Stenographer, Assistant Grade III recruitment application form available at ecourts.gov.in/korea. Send the application to the below address on or before 15th December-2017 through post.